X-rays and gamma-rays are a privileged band to study accretion onto compact objects (black holes, neutron stars, white dwarfs) and their environment. Research activities in this field at ESTEC focus on the physics of outflows produced in the innermost regions of Active Galactic Nuclei (AGN), the physics and the geometry of matter surrounding them (possible repository of the black hole feeding), as well as the accretion physics of matter from a donor star onto a stellar-mass compact object (black hole, neutron star, white dwarfs). Other areas include gamma-ray bursts as their (potential) electromagnetic counterparts of gravitational wave emitters. ESA's satellites study accretion physics and gamma-ray bursts over a broad range of wavelengths, from infrared to optical, and in particular using X-rays detected by XMM-Newton and INTEGRAL. The ESTEC researchers collaborate intensively with the AGN Group and the High-Energy Accretion Working Group at ESAC. A list of publications on refereed journals of the group is available here. Accretion powers the strong X-ray emission from compact objects in binary systems. In many of these systems there are evidences that the accretion process is mediated by an accretion disk. 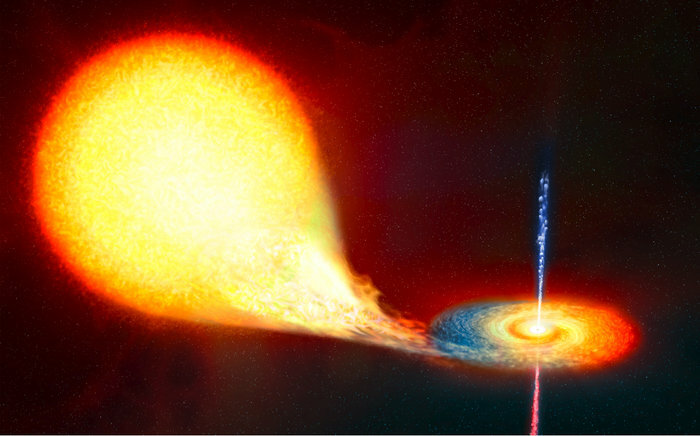 Binaries in which the compact object is a black hole or neutron star are referred to as X-ray binaries; those with a white dwarf are called Cataclysmic Variables. The majority of these binaries display a wide range of timing and spectral phenomena at various wavelength, including X-rays. The study of the X-ray emission yields information about the physics of accretion and permits the determination of some properties of these systems, such as their geometry, the inclination of the system with respect to the line of sight, the temperature of the disc, the temperature of the corona composed of relativistic electrons surrounding the compact object, and so on. Most of the neutron-star binaries show X-ray bursts. These are thermonuclear explosions that occur in the envelopes of accreting neutron stars, and can reveal the composition of the accreted material as well as the conditions of accretion. One of the current research projects is a program to monitor the source activity in the Galactic bulge regularly and frequently with INTEGRAL, following ~200 sources (mainly X-ray binaries) every INTEGRAL orbit (~2.6 days) for 3.5 hours, whenever the region is visible and making X-ray and gamma-ray light curves and images available as soon as possible: the INTEGRAL Galactic bulge monitoring program. Please, contact Erik Kuulkers and Arvind Parmar for further information. The environment of accreting supermassive black holes in AGN is rich of gas and dust. Researcher at ESAC are interested in investigating the nature of the nuclear dust (posited to be distributed according to an azhimutally-symmetric structure co-planar to the accretion disk, the "torus"), and of the physical mechanisms responsible for the high-energy emission of the X-ray Narrow Line Region, extending over up to 1 kpc from a central engine and morphologically coincident with the optical ionization cones. Recently scientists at ESTEC have led an intense observational campaign with the NuSTAR, Suzaku, and XMM-Newton observatories, to probe the nature of the torus in the nearby, heavily obscured AGN Markarian 3. The spectroscopic monitoring of this object over the whole range of time-scales from a few days to almost one year allowed us to carry out the first X-ray tomography of the nuclear dust, constrining the number distribution of clouds long the line-of-sight, their average density, and their dynamical state. Suzaku/XIS (left panel) and NuSTAR (right panel) spectra of the monitoring campaign of Markarian 3 (dates in the insets). Figures extracted from Guainazzi et al., 2016, MNRAS, 460, 1954. Please, contact Matteo Guainazzi for further information. In a series of recent papers, a group led by Dr. Laha (UCSD) and ESTEC scientists has studied the largest high-resolution spectroscopic sample of nearby AGN observed with the RGS spectrometer on board XMM-Newton (the "WAX" sample). The aim of this study is to characterize the occurrence rate and physical properties of ionized outflows in AGN - a potential source of the "AGN feedback" supposed to regulate the concurrent evolution of accreting black holes and host galaxies on cosmological scales. Radial profile of the column density (left panel) and ionization parameter (right panel) in the WAX (red points) and UFOs (blue points, Tombesi et al., 2010, A&A, 521, 57) samples. Figure extracted from Laha, Guainazzi, et al., 2016, MNRAS, 457, 3986.